Midwest Machinery Movers – Weight Restrictions – Can My Machine Get Here? In Michigan, when the pot holes start showing up, we know that the frost is moving out of the ground. Along with the frost moving come the Spring Weight Restrictions. For most people, this doesn’t affect their day-to-day life, but if you are planning on receiving a heavy piece of equipment, it can put a stop to your project. Our advice – plan ahead. If you have a project that includes moving a heavy piece of machinery within Michigan, it’s best to avoid mid-February to mid-April. Because the Weight Restrictions vary with the weather, there’s no way to predict exactly when restrictions will go on or come off. 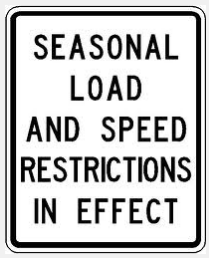 It’s better to plan around those early spring months for loads heavier than the legal axle limit. We can help you determine if the weight restrictions will impact your project.